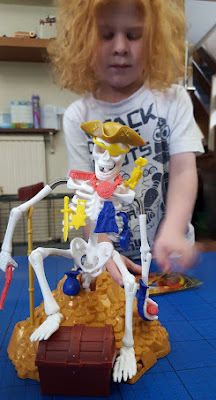 Rattle Me Bones is one of this Summer's new Drumond Park games, and it's quickly become a favourite in our house - particularly with the younger 2 boys. It has a nostalgic feel and is nicely made with a pirate treasure theme - who wouldn't love trying to steal an old pirate's treasure! 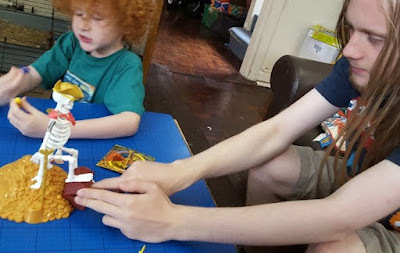 The game is suitable for 2-4 players aged 5 and up, and the rules are simple. 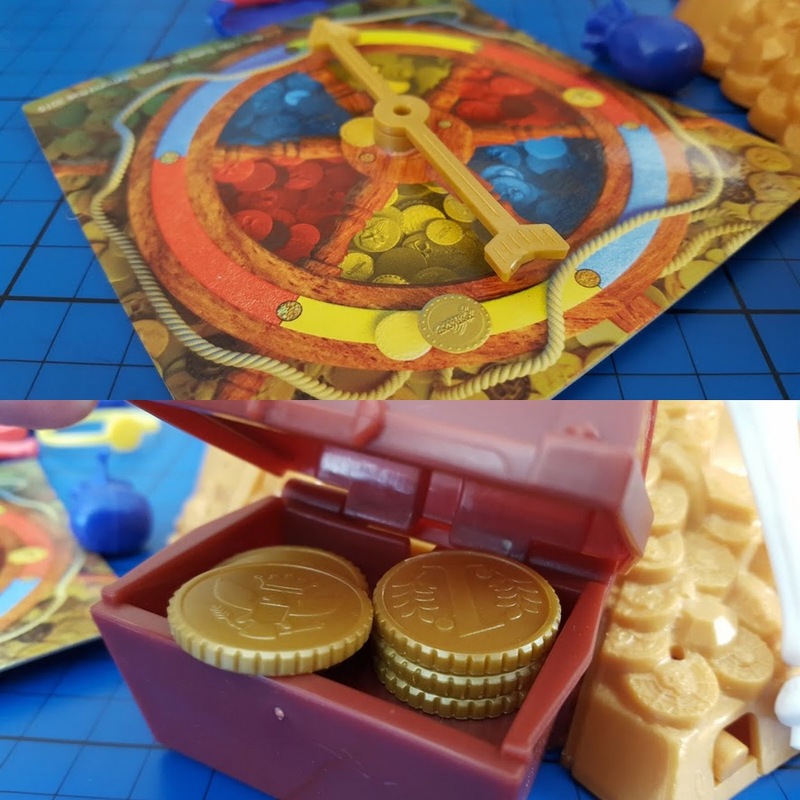 Spin the spinner to see which colour treasure you are allowed to attempt to steal. 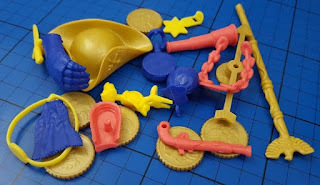 If all treasure in your colour has been taken already, then you have to take a gold coin from the treasure chest - just don't disturb Captain Boney. Once you have collected 3 pieces of treasure (coins have a value of 1/2 treasure) then you earn the right to try to grab Captain Boney's golden hat. The person who grabs the hat is the winner. Steal his treasure as carefully as you can and you can keep it, but if he's disturbed he'll leap about and throw everything everywhere - and you have to put the treasure back. Captain Boney is well-made and quite a nice little skeleton, and he sits well on his pile of loot. The accessories are a little tricky to position and remove, but otherwise it would be simple! We found that after a bit of practice we found the game a little bit easy, so teenagers and adults had to put 1 hand behind their back. Unlike most Drumond Park games,Captain Boney takes 3 AA batteries which aren't included, but seem to last okay, and add a very noisy dimension when he jumps because he also lets out a proper pirate wail!! 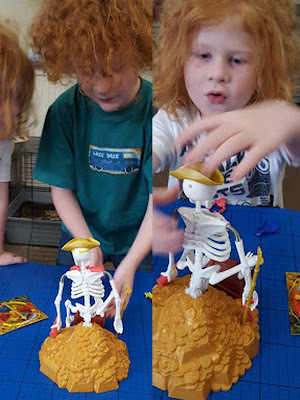 Rattle Me Bones is another great family game to play with different generations. Loads of fun - especially when the pirate jumps when you aren't expecting it, easy to play and learn and everyone has a fair chance of winning. Placing and removing the items on the skeleton will help your younger people develop hand-eye co-ordination and fine motor skills, and as they play they learn about turn-taking and winning and losing, the basics of most family games. 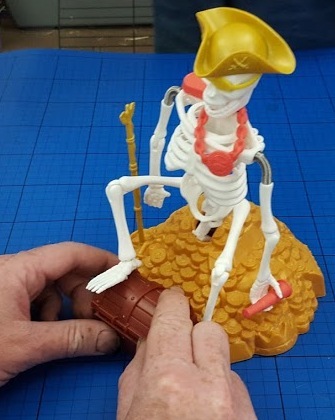 Rattle Me Bones has a recommended retail price of £22.99 and is available at all good toy shops and games retailers. Drumond Park have kindly given a copy of Rattle Me Bones as a prize for one of my readers. Entry is by Gleam form below. No entries are mandatory, and each task completed will give you another entry into the draw. The giveaway will end at midnight Sunday 4th October. UK entries only. 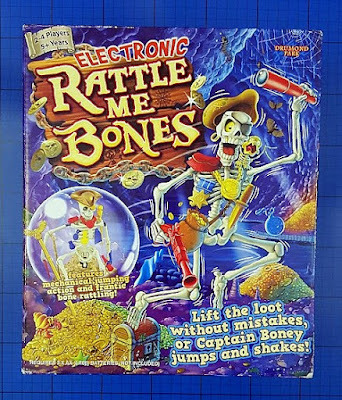 We were sent our copy of Rattle Me Bones for review. i put my name into a pirate name generator and it came up with 'Kate the Dagger' - my father in law was 'Wally the Bitter' - so funny, had us all laughing loads. At the moment, Captain Cough, I've got pneumonia! I would be Captain Stinky Feet & I would keep my treasure in my boots arrggh!! I would be just Pirat Kamila.